In Cienfuegos, Cuba, on the fourth day of our tour, our guides Román and Jorge told us they had a surprise for us. Earlier in the day, a possible stop at the National Botanical Gardens hadn’t worked out (maybe they were closed that day; we never heard), so we arrived by bus in Cienfuegos early, and wandered around a while to see Punta Gorda peninsula and kill time before lunch. After lunch, we were taken to the center of town for a surprise. Surprise number one, a singer, didn’t show up. Surprise number two, salsa dance lessons, didn’t pan out either. The third back-up plan was a charm. The Chamber Choir of Cienfuegos sang for us, everything from 16th Century church music to American spirituals to a jazzy pop song by Cuban Benny Moré. We thanked our resourceful guides with sincere assurances this was indeed our first choice. Visiting Cuba with a small tour group called Cuba Unbound (part of ROW Adventures), we expected to encounter the unexpected. Ours was specifically a walking tour of national parks, and we’ll write more about that. In essence, things went according to schedule. But Jorge and Román enjoyed keeping many features a “surprise,” to spare everyone high expectations or minor disappointments. Our group quickly came to appreciate the concept of planning in triplicate, so when two scenarios failed, another would be ready. Every Sunday noon, the Santeros invite tourists to enjoy the art installations of Callejón Hamel…and to donate a little something. Havana is alternately lovely and creepy looking. Great landmarks like the main squares, the old Capitol building and adjacent National Theater are renovated. 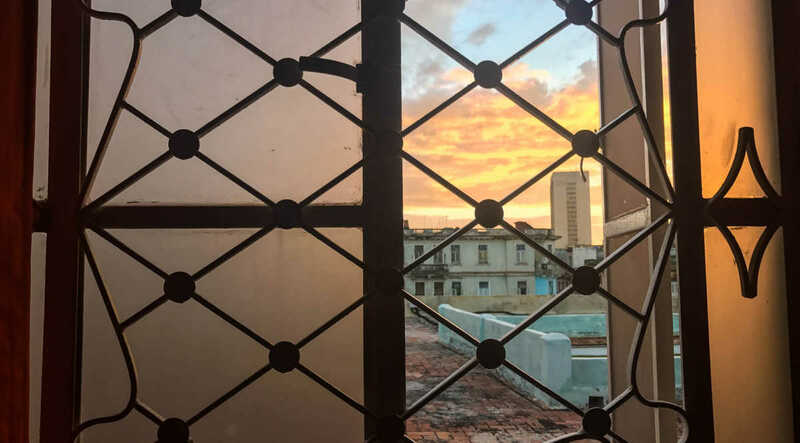 The three neighborhoods we visited (Old Havana, Central Havana, and Vedado) are lined with what were once grand mansions, elegant townhouses, and neo-classic office buildings. But now most buildings are carved up into apartments. Vacant lots, decayed facades and gutted buildings interspersed with the crowded apartments make it appear that the city has been bombed with precision. Faithful to our history, our story. Inside homes and cafes, sparse neon lighting casts a blue-green glare over the family table and chairs, muting the saturated pinks and corals of daytime. Water pressure is low; doors and windows are grated. Balconies are architectural decoration; residents tend to hang out on the interior courtyard stairs or on the street. 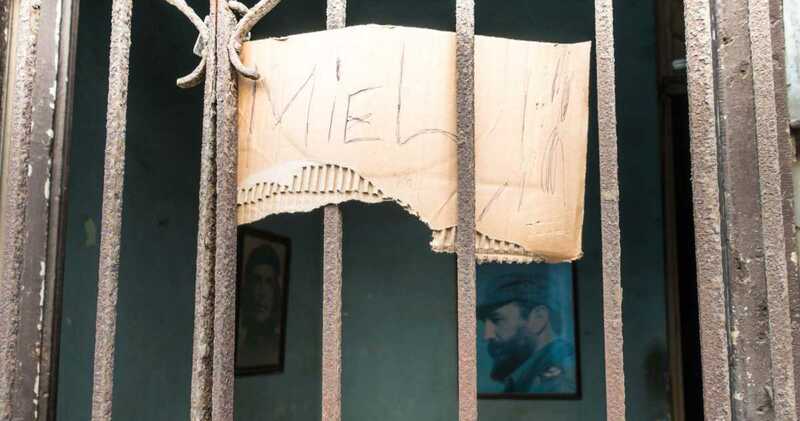 Around town, but especially on the main thoroughfares and around Plaza de la Revolución, signs exhort people to remember Fidel and the revolution, proclaim their loyalty to Fidel until the ‘sea dries up,’ and to appreciate the good life these fifty years of struggle have bestowed. Fidel Siempre (Fidel Always). Car and driver for hire. Cubans generally don’t own cars. 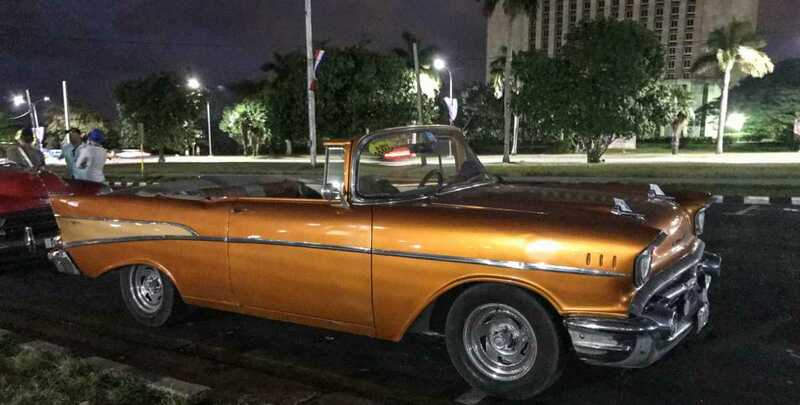 The cool cars commonly photographed in Havana aren’t prevalent except around the airport, international hotels and tourist sites, where they make popular taxis. The streets of central Havana are populated by all ages. Locals might use bicycle taxis to get across town, or flag down a bus or free ride for longer journeys. There are lines for everything, everywhere. 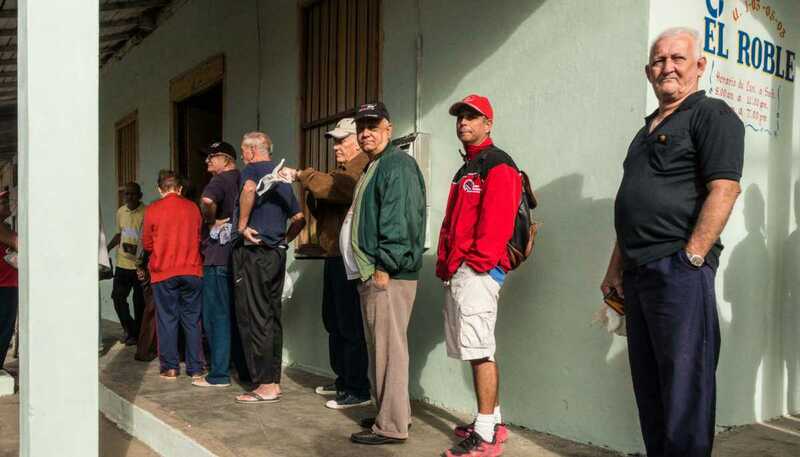 Cubans call it the Country of Long Lines: Prepare to wait for phones, banks, internet, food, cigarettes and candy, interviews, check-ins, and ice cream. The restaurant diet that most visitors will enjoy is primarily meat (chicken, pork, beef, lamb) served with rice and beans and some salad or vegetable side. Seafood including lobster, shrimp, red snapper, etc., is featured in many restaurants. But local people can’t buy seafood. Fishing licenses are tightly held, and even beef and lamb might be reserved for visitors. It’s more common than not for a restaurant to let you know what is available on the menu, rather than what isn’t. At popular D’Lirios Cafe, for example, across from the Capitol, no seafood could be ordered as a main course, only as a sampler platter. At Café Paris, the house special chicken preparation wasn’t available, only the grilled option; the entire pizza section of the menu was unavailable; spaghetti could be had one way: with marinara sauce. Local beer (Cristal and Bucanero) is reserved for nicer hotels and restaurants. Since Cuban beer production can’t satisfy demand, the rest of the vendors sell imported Heineken. Cuba provides a ration system for inexpensive bread, and lines form early in the day. Ration papers indicate how many people (with their ages) are in the household. Better bread is available for those who can afford it, or who might run a Casa Particular (bed and breakfast). But in this and every case of goods and produce, supplies may not last into the afternoon. Jorge and Tom surveying Benito’s Tobacco Plantation with a thumbs-up and a cigar. Embargo implies simply that the United States doesn’t trade with Cuba directly. In fact, however, the United States also penalizes its own trade partners for doing business with Cuba. A fine is imposed and the vessel is prohibited from landing in the U.S. for six months following their Cuba delivery. As a result, goods might be delivered to Panama and re-loaded for delivery to Cuba, for example, which means scarcity and higher prices for Cuban people. While Cuba managed to work around the U.S. blockade by relying on Soviet support, the collapse of the Soviet Union has left a huge mark on the country. Many of Cuba’s highly educated lost their jobs, operations ceased on infrastructure projects, and the principal buyer of Cuba’s sugar disappeared. View of the Malecón (sea wall) of Havana. Fishing licenses and boat sizes are tightly controlled. Seafood is rarely available to locals. Companies/countries wishing to invest in Cuba (who wouldn’t want to considering its resources and well-educated population) are allowed to retain 49% of the profits, giving 51% and control to the Cuban government. Not surprising, there aren’t a lot of takers. We spotted a Japanese-funded planetarium in Old Havana; cars come from various European and Asian countries. On the other hand, to import oil from Venezuela, Cuba sends its well-trained medical professionals abroad. 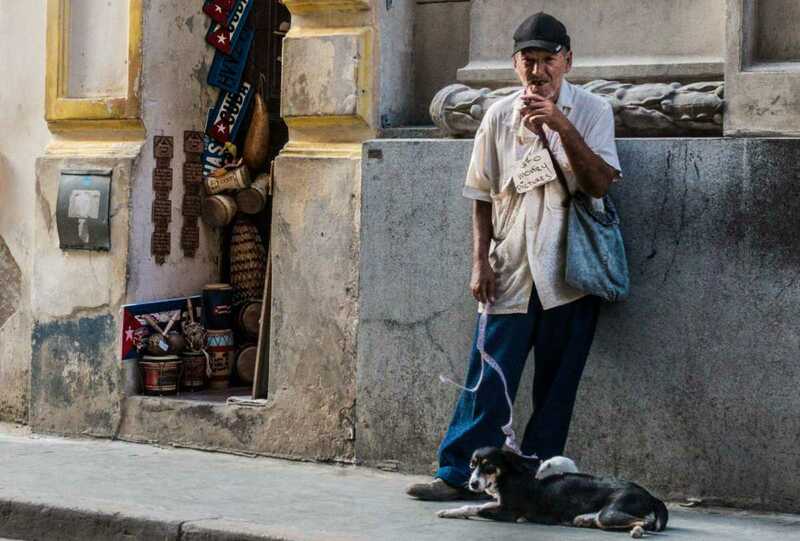 The general vibe of people in Havana and throughout Cuba is congenial and industrious. The mixed-race population appears relaxed in its blend of Afro-Cuban, Spanish, and Indigenous heritage. The ways in which people cobble together a living is equally varied, though most depend on tourism, if not open trade with the world. 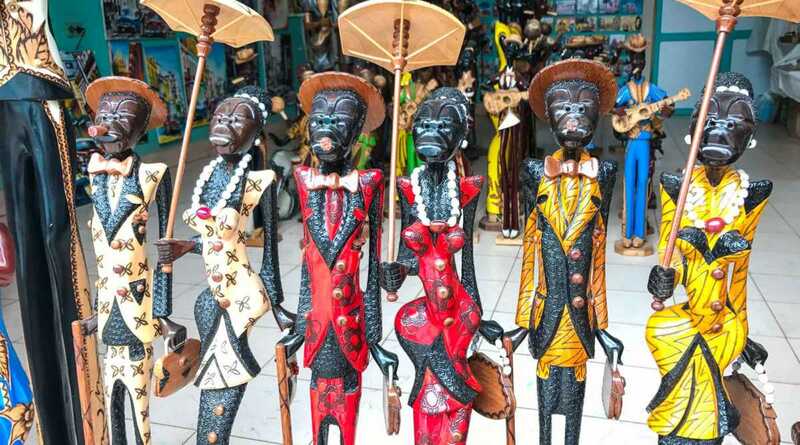 In Trinidad, a UNESCO World Heritage Site, genuine arts and crafts outnumber the standard souvenirs. The average income in Cuba is about $25 (700 CUP) per month. Of course cost of living is also low. [Note that Cubans earn and spend in Pesos (roughly 25 CUP to one USD) and visitors spend in CUC (roughly pegged to one USD, minus a 10% change fee. Many American visitors find Cuba to be more expensive than expected.] You don’t see abject poverty in Cuba; most people are on equal footing, and most people are eager to make a little on the side. The means of earning that extra income depend on the locale–urban vs rural–and are often ingenious. Like tobacco, other agricultural products are owned by the government, but a small percentage can be sold directly by the grower or their network. The operators of Casas Particulares (in home Bed and Breakfast establishments) are not allowed to have employees, must not expand their homes to build more guest rooms, and do pay a commission on top of fees to the government. A novelty dog with white rat serves to attract money for photos. To the left is a shop in a niche between two buildings. In the city of Trinidad, a UNESCO World Heritage designated site, some of the controls have relaxed a bit as the government recognizes the need to host and entertain tourists. One Trinidad resident who lost his job when the Soviet Union collapsed, claims he started his Casa Particular for two reasons: for income and for information. Learning from visitors, he now offers other approved ‘activities’ for tourists related to photography and horseback riding. Over the past couple decades, Trinidad has added some 200 ‘activities’ (we’d call them businesses) for tourists. 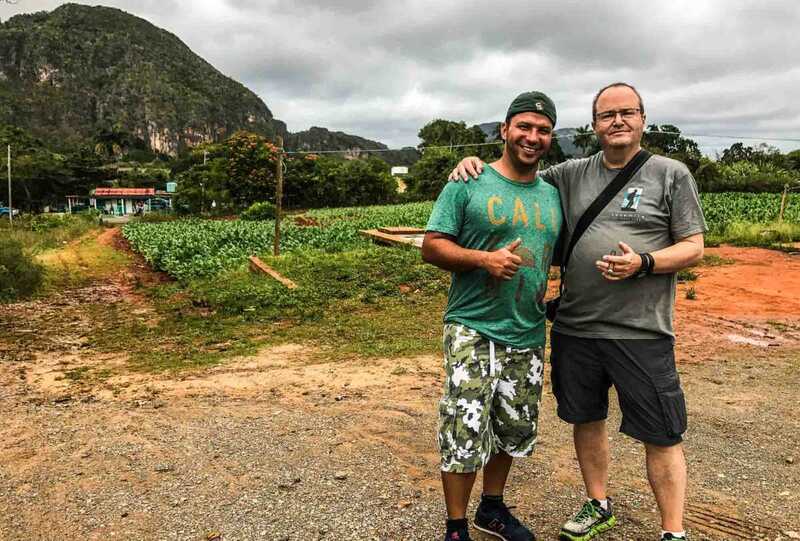 For people like Julio, it makes living in Cuba tolerable, if not lucrative. 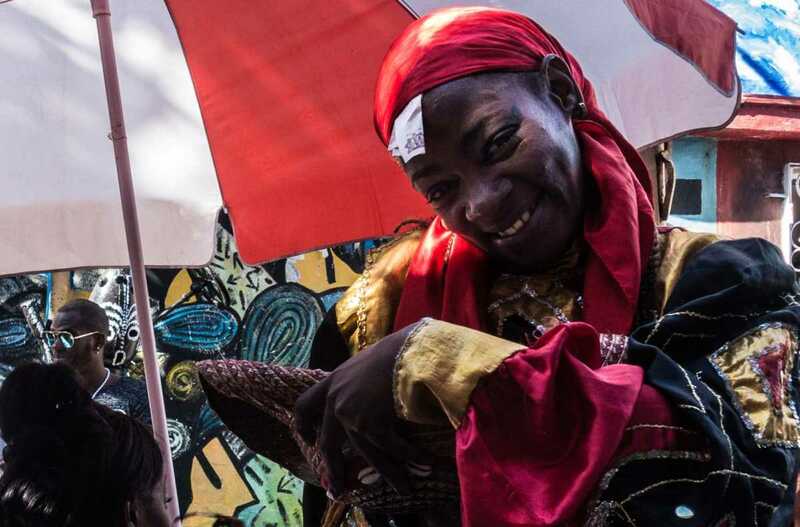 In Havana, enterprising people sell eggs from their city chickens, work as musicians, offer art or crafts for sale, sell photo opps, taxi rides, hair weaving, or their personal stash of cigars. In some places, women beg for goods they might resell, or send their kids out to beg for money. An enterprising Havana resident sells honey (miel) direct to the street. The question remains, would the Cuban government allow free trade even if the United States were to end the blockade? And now that the ‘Dry Feet’ clause was removed from U.S. immigration policy (while we were in Cuba), will Cuba grant visitor visas to the U.S. more freely? Will the giant division between some Florida Cubans and Cubans on the island begin to repair? I don’t know; nobody seems to know. But we were reminded by several Cubans that they’re not so enamored by the American dream. “The American Dream doesn’t exist for African Americans,” said one. Too much gun violence, said another. And then there is the unpredictable Trump factor, they all noted. Maybe it’s time The States come up with a couple back-up ‘surprises’ in case the current experiment fails. Great read! I’ve wondered about Cuba’s ability to handle tourism. You gave me great insight. Thanks, Jackie. Our notebooks filled up fast. It was so great to have time to talk to people along the way. What an informative post! I feel like I actually visited Cuba as it is right now. I’m going to share this on Facebook and Twitter. Of course I still want to go, maybe now more than before. Was that what you were going for? Thx for this insightful post, Kris. I’ve been to Cuba 3x, but not for a long while. We we most impressed by the pride and resilience of the people. They always find a way to get things done or work around obstacles. Yes, I agree, Doreen. To generalize a bit, I think Cubans are among the most resourceful people I’ve met. Let’s hope that life becomes easier for them. We’d love to see more open trade and communication. Great look at Cuba. It is a fascinating country. I wonder how things will unfold over the next few years. I too think the people are resilient and full of life and joy in spite of hardships. It would be nice to see things be easier for them. Thanks Donna. I wonder when you were last there and if you are likely to travel there again soon. While some people are saying ‘visit Cuba before it changes too much,’ I say let there be progress! It has been quite a while since I was there. It was in 2004. We stayed mostly at a resort in Varadero, but took a couple of day trips beyond that, one of which took us to Havana. I went to Cuba in June of this year and truly enjoyed experiencing the rich and diverse culture of the island. I hope to go back this year. While our travel experiences differed, your description of the political climate was spot on.